One of the girls who made it to the top 24 is Filipino-American Ramiele Malubay from Miramar, Florida. She did her own rendition of the song "You Don't Have To Say You Love Me" last Tuesday. Apparently, the judges and the crowd liked her performance 'coz she didn't get voted out and still has the chance to perform again next week. Personally, she's one of my bets. I like her 'coz she's cute, charming, humble and petite. Her voice is amazingly strong and powerful and she sings from her heart. I also think her references to Philippine culture was fantastic. She cites Regine Velasquez and Lani Misalucha as some of her musical influences. 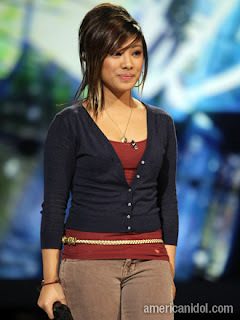 I hope she will continue to make it all the way to the Final 12.